Minting and Gautby Summer Fete – the results! Firstly, a huge thank you to all of you wonderful people who supported our fete by buying and selling raffle tickets, donating prizes, baking cakes, staffing stalls, playing games, buying plants and all the other ways you helped! Thank you also to the marvellous Minting Choir, Soloists and David for a musical treat! Congratulations to all our raffle winners – Our top 5 prizes went to G Bell, D Spencer, S Partington, H. Gurnhill and R Barnes. Other prize winners are being contacted. 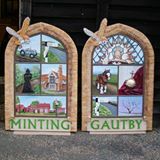 After expenses, the Fete and Raffle raised £483.53 each for Minting and Gautby Village Halls.